Preston Media Group is a marketing firm that helps you grow your business by growing your brand. We specialize in marketing online with social media and blogging, and marketing offline with trade shows and local events. We also regularly speak at conferences and events about how to use social media to grow your business or blog. How did Preston Media Group come to be? It all started with a dog… sort of. We have provided web design and web hosting for several years, but in 2010, we started a pet blog for our dog Preston, written in his voice and point of view. The site is called PrestonSpeaks.com. It was initially just for family and friends, but quickly started gaining quite a following and we could see it had the potential to be much more. By using the power of blogging and social media, PrestonSpeaks.com has become one of the top dog blogs with large followings all across social media. With the popularity of PrestonSpeaks.com, we renamed our company Preston Media Group, LLC. You can follow us on Twitter at @PrestonMediaGrp. Rachel Phelps is a sought-after pet industry influencer best known for her development of the nationally recognized dog blog PrestonSpeaks.com. She is a professional member of the Dog Writers Association of America, the Cat Writers Association, and is a regular speaker on pet issues and the use of social media. She also oversees the social media endeavors, website content, design, and general PR for several organizations. Rachel is very involved in the animal welfare community. She serves on the board of directors of WestieMed and serves as their national Marketing Director. 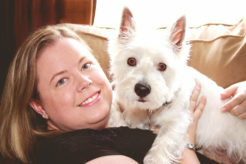 She also serves on the board of Westie Rescue Indiana and acts as an area coordinator and foster home. Previously, she served on the board of her local humane society. Rachel is also a part-time college professor leading classes on computer information systems and social media marketing. She has a Masters of Business Administration (MBA), a Masters of Public Administration (MPA), and a Bachelor of Science degree in Computer Science. Brad Phelps is an information technology professional with over fifteen years of experience. He currently works full-time in the information technology industry and has been working part-time since 2006 helping small businesses with their online efforts. Brad has an Masters Degree in Business Administration (MBA) and a Bachelor of Science degree in Computer Science and Business Administration. He is a Project Management Professional (PMP) who has successfully led million dollar projects and holds several technical certifications including Red Hat Certified Engineer, VMware Certified Professional, and Microsoft Certified Systems Administrator. Brad is a member of Sigma Phi Epsilon fraternity and volunteers with his home chapter as Chapter Counselor and Alumni Corporation President. He regularly facilitates leadership training for chapter officers at the local and regional level. He is also a member of ToastMasters International and a part-time college professor leading classes on computer information systems. Brad has given presentations on social media and sat on a social media panel at the 2012 Project Management Institute Region 2 Conference. © 2019 Preston Media Group.